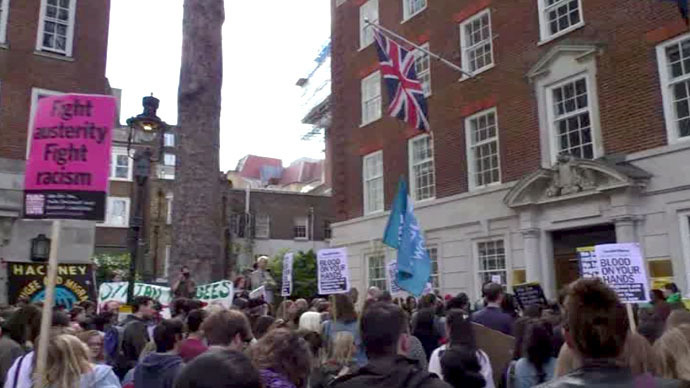 Dozens of protestors gathered outside the European Commission’s office in London on Saturday to condemn the EU’s policies towards non-European migrants, which are blamed for the deaths of hundreds of people in a shipwreck in the Mediterranean last week. The demonstrators chanted, “Don’t let them drown” and carried banners, reading, “Syrian refugees welcome here,” “Blood on your hands,” as well as other placards. They called on the EU to restart the Mare Nostrum search and rescue operations in the Mediterranean Sea, which helped 150,000 migrants safely arrive in Europe in 2013. The Migrant Lives Matter protest in the British capital was organized by the Movement Against Xenophobia and supported by groups including Stop the War Coalition and Stand Up To Racism. 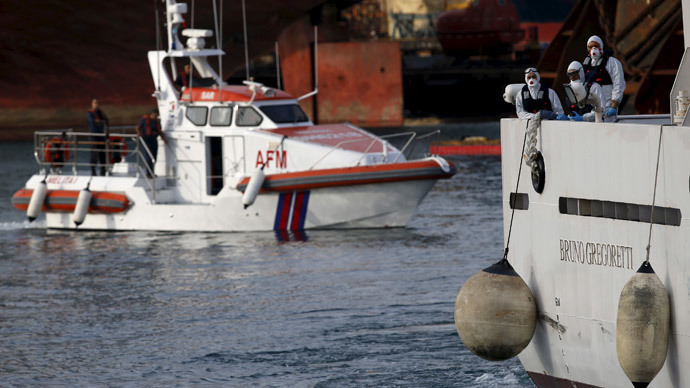 The deadliest migrant tragedy in the Mediterranean Sea “exposed the appalling human cost of the ‘Fortress Europe’ immigration policy imposed by [the] European Union and the British government,” the organizers of the rally said in a statement. Activists blame figures like the Sun newspaper columnist Katie Hopkins and the anti-immigrant UK Independence Party (UKIP) leader, Nigel Farage for a rise in anti-immigration sentiment in Britain. “Anti-migrant rhetoric of the establishment politicians, UKIP and the Katie Hopkins obsessed media has led to thousands of people, many of whom are fleeing nations torn apart by Western intervention, drowning in the sea,” they added. The United Nations condemned Hopkins on Friday after she described migrants as “cockroaches” and “feral humans” in her column in the Sun. At least, 800 people fleeing Africa through Libya lost their lives on April 19 when a migrant boat capsized and sank after leaving Tripoli. The incident was preceded by a similar shipwreck, in which 400 drowned a week earlier. The migrant death toll in the Mediterranean has already reached 1,700 this year. 4,000 bodies were recovered from the sea in 2014. Nearly 25,000 people applied for asylum in the UK last year. Many travelled through mainland Europe, before ending up at a makeshift camp at Calais, the main terminal for border crossings into the UK. RT has visited the camp, known as the Jungle, which has been rebuilt several times, and is currently on land allocated by the French government. The approximately 2,000 people who live there, the majority of whom are Eritreans, Afghans and Syrians are having to endure atrocious conditions, which encourage disease and crime. There is no easy access to clean water and electricity, a tactic that discourages them from staying. “These people want to go to Britain, this is Britain’s responsibility and a result of wars in other parts of the world. We can’t cope with the influx, Calais is besieged. More people are coming. The situation is getting worse,” Philippe Mignonet, the deputy mayor of Calais told RT.